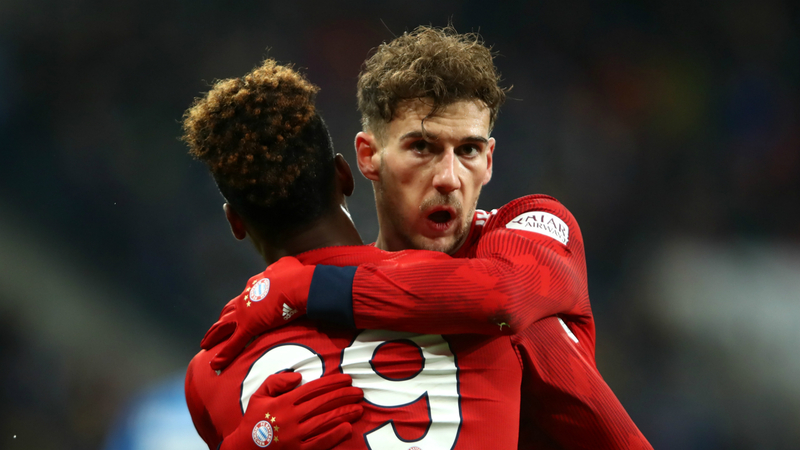 Leon Goretzka's maiden Bundesliga brace guided Bayern Munich to a hard-earned 3-1 win at Hoffenheim in their first fixture of 2019. Hoffenheim took a 10-match unbeaten streak into Friday's encounter but were unable to build on Nico Schulz's fine 59th-minute strike in Julian Naglesmann's 100th match at the helm in Germany's top flight. Robert Lewandowski provided the knockout blow three minutes from the end to trim Borussia Dortmund's advantage back to three points ahead of the league-leaders' tricky trip to fourth-placed RB Leipzig on Saturday. He broke the deadlock in the 34th minute with a deflected close-range finish after Baumann saved Lewandowski's initial header, before David Alaba's inch-perfect cross enabled the midfielder to cap a swift counter-attack in first-half stoppage time. The hosts pressed with renewed hope and an Adam Szalai header drew a crucial denial from the Bayern captain, but the comeback was extinguished when Muller intelligently turned James Rodriguez's dinked pass into Lewandowski's path for the sealer. They were certainly made to toil victory but, after a fluent first 45 minutes and second period full of perspiration, Kovac will view this result as a significant step forward in his team's attempt to overhaul BVB. - Bayern manager Niko Kovac has won six Bundesliga games in a row for the first time in his career as a manager. - No other team collected as many points away from home in this Bundesliga season as Bayern (24). - Goretzka scored his first brace in his 131st Bundesliga game. - The midfielder has scored all four of his Bundesliga goals for Bayern away from home and in the 12 minutes before half time. - Javi Martinez celebrated his 100th win in his 120th game, earlier than any other player in the competition's history.